IPCNY’s New Prints Program was created in 2000 as a platform for artists from a wide range of backgrounds working in the medium of print. The biannual open-call exhibitions feature prints in a variety of formats and techniques produced in the preceding twelve months. Juried by stakeholders in the field, the resulting exhibitions offer snapshots of what artists are contending with in the moment, leading a sense of immediacy to each presentation. 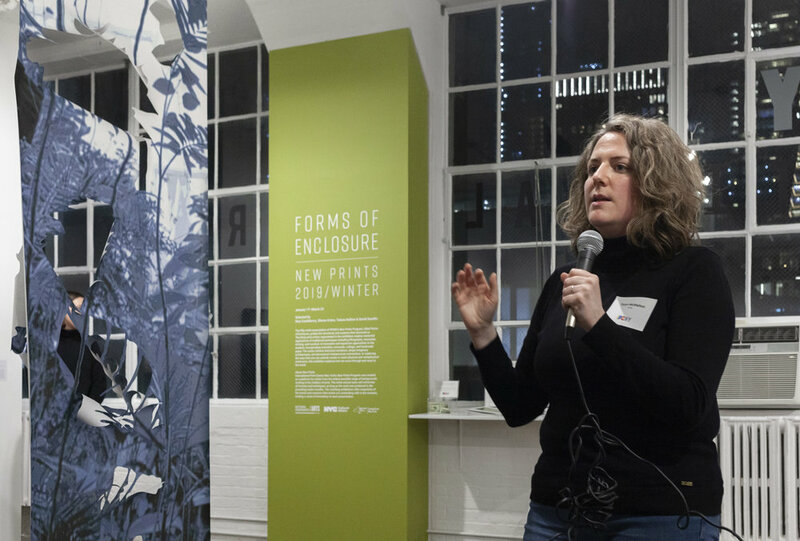 In 2017, IPCNY expanded the New Prints open-call exhibition series by offering each cohort of exhibiting artists further opportunities to receive further training, guidance, and exposure. A month-long Artist Residency program, divided between IPCNY's workshop space and our partners at EFA Robert Blackburn Printmaking Workshop. An Artist Mentorship program designed provide the artist with critical feedback, career guidance, and introductions in the field. Sponsored Coursework, which funds workshops or classes of the artist's choice. commitment to developing their print practice. The New Prints Program is made possible by the New York State Council on the Arts with the support of Governor Andrew M. Cuomo and the New York State Legislature; the National Endowment for the Arts; the New York City Department of Cultural Affairs in partnership with the City Council, and by the Areté Foundation.